I don’t know about you, but sometimes Debbie and I get tired of always having to choose what we have for dinner! Sometimes I just cant think of what I want. When I ask Kevin what he wants, he hardly ever helps. He just says, “Anything you make is good” which is nice of him to say, but IT DOESN’T HELP ME! Debbie shoots herself in the foot in the same situation, because she said that when Mark suggests something, she often says “Ehhhh, I don’t really feel like that”. So I don’t have much sympathy for her lol. So anyways, the other day I asked Kevin what he wanted for dinner and he told me that he felt like a green salad. He must have had fast food that day, but I didn’t ask, I was just thankful that I got a suggestion ;). Green salad it is! For a tip on how to cook a perfect hard boiled egg, check out the tip on our No Mayo Potato Salad post. If you don’t like strong red onions, slice or chop them up and soak them in cold water for about 5 – 10 mins. It takes the bite right out of them and leaves you with sweet onions! 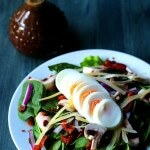 I gotta tell you, this has to be my favorite Balsamic Vinaigrette to date! 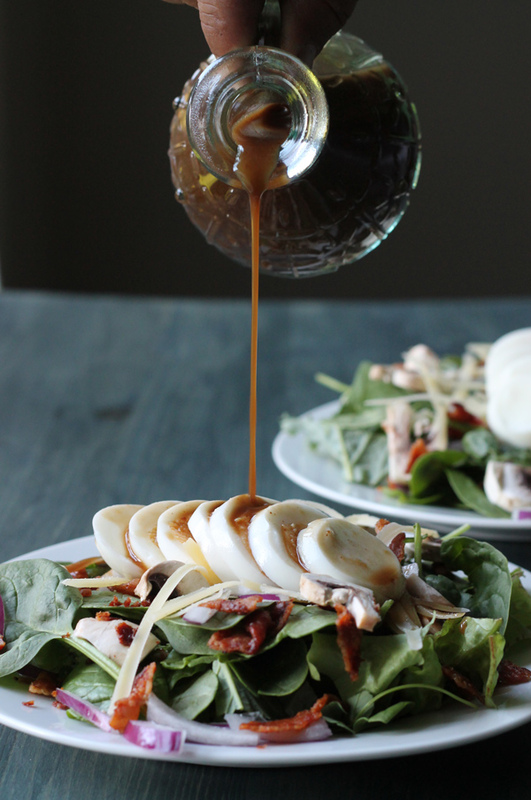 The maple syrup just enhances the flavor of the balsamic vinegar perfectly. 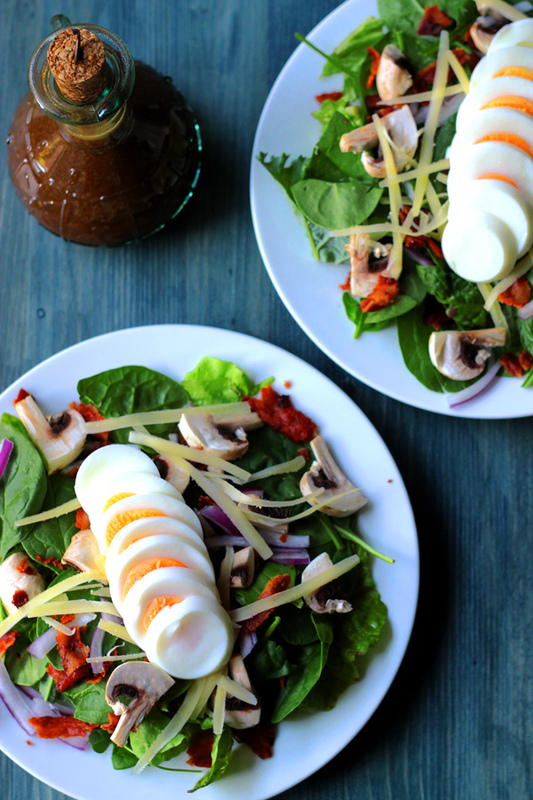 Its slightly sweet and tangy and perfect for this salad! Kevin told me he really liked the salad and that I should make it again. I told him that next time I ask him what he wants for dinner he should say “Spinach Salad”! 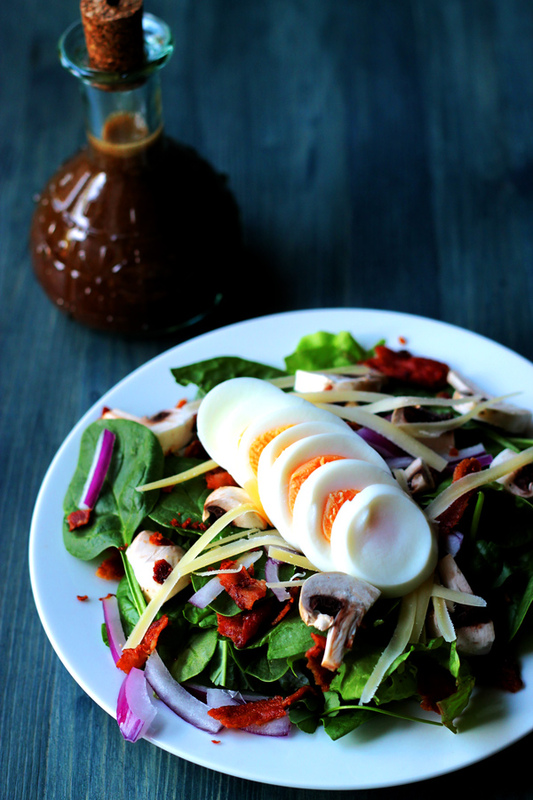 A delicious spinach salad with tomatoes, eggs, mushrooms, cheese and balsamic vinaigrette. In a jar or container with a lid, add all the ingredients for the dressing and shake well. Add Salt to taste. Cook your hard boiled eggs and set aside to cool. 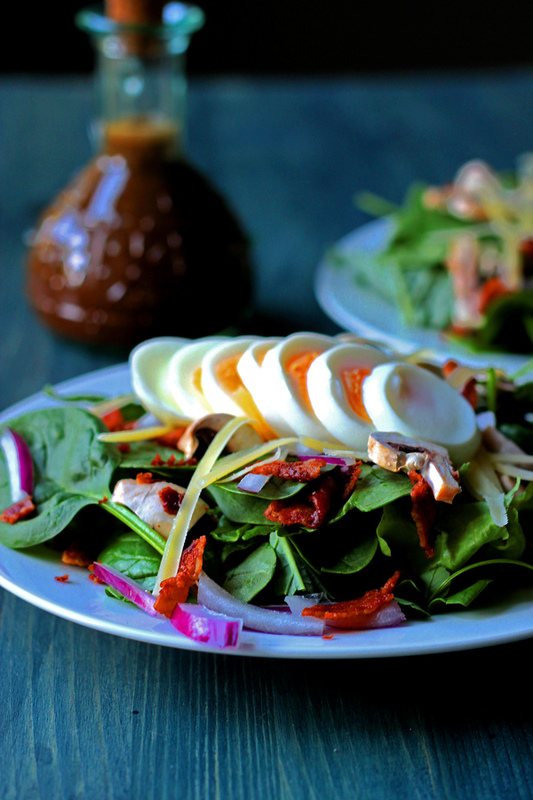 Place the spinach on a plate and arrange the mushrooms, tomato, onion, bacon bits and cheese on top. Slice your cooled hardboiled egg and place on top. Drizzle with the dressing and serve!